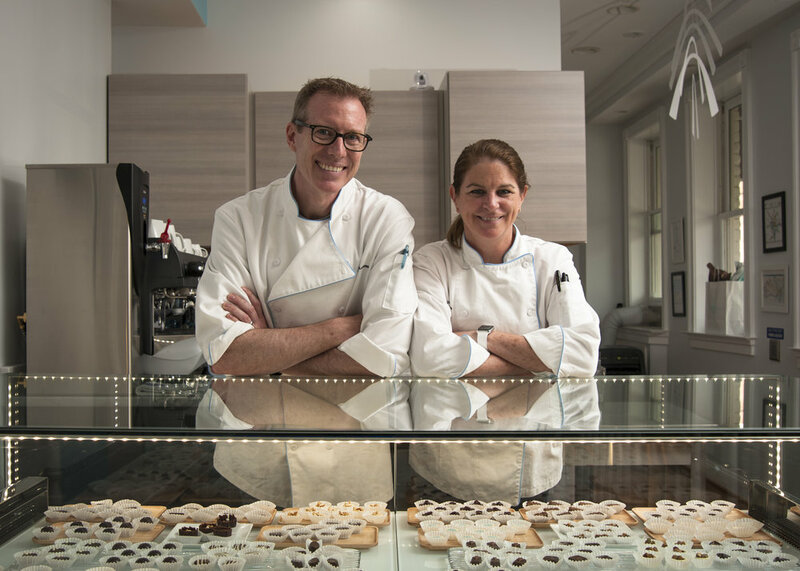 We are artisan chocolatiers living and working in Old Town, Alexandria, across the river from Washington, DC. Our retail studio, at the corner of N. Patrick and King Street, is in a hundred-year-old building that was rehabbed in 2005. We create all our pieces onsite, with production downstairs and our retail shop upstairs. And while our specialties are truffles, bonbons and chocolates in delightfully complex and sometimes whimsical flavors (solo, or gift boxed in trios, sixes, sixteens and twenty-fours), we welcome you to stop by for an espresso, coffee, tea or drinking chocolate and rest a moment in our micro-cafe. To complement our own designs, we carry a few select bean-to-bar products from chocolate makers that embrace our unique philosophy: chocolate as form, function, and deliciously fine art meant to seduce all the senses at once. Oh, and for those that crave a little something familiar (yet exotic), we carry chocolate-coated somethings that remind us we are all only mostly grown up, and that chocolate will always be a treat for those that have been especially good! 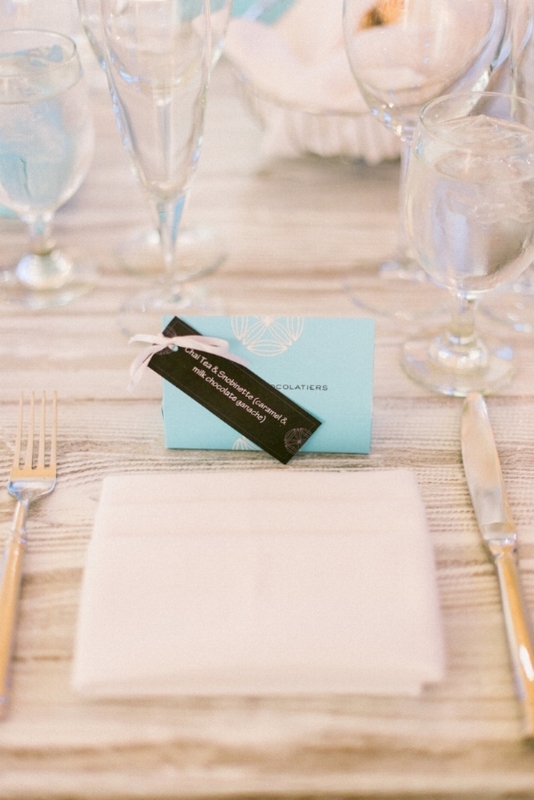 Whether it's a wedding, a reunion, or a corporate event, Blüprint Chocolates are always a welcome guest. We can provide gift Triples or Fours with custom tags, flavors, and even designs. Add your logo or initials to one of our delicious truffles for a treat your guests will remember. Well, for one, we’re paying homage to where the idea for our business was born – in Copenhagen, hence the “umlaut” in our name. Sure, chocolate-making is an art form, however, our distinctive approach is also grounded in science. Architecture significantly influences the compositions, flavors and structures of our chocolates. We adhere to a strict formula: the right proportions. The right temperatures. The right balance of physical characteristics – think gloss, snap, texture – and, of course, taste. Our professional backgrounds are rooted in food science and engineering, which gives us a clear understanding of how the many elements in our chocolates interact and reinforce each other. We are extremely discerning when it comes to these ingredients, ensuring the highest-quality, stable and flavorful products. Above all else, we pride ourselves on the fact that we aren’t just “making” chocolates. We’re blending the beauty, durability and utility inherent in architecture with the hierarchy, scale and unity found in visually appealing designs. The result is a road map – a Blüprint, if you will – for precisely ünique chocolates. And that’s how our name came to be. Our story continues to grow, and we love to tell it. If you'd like to talk to Kim or Bruce please use the link below. We're always on the lookout for new staff with a love of chocolate and a zest for life. Reach out to the team below.